As this is primarily a gardening blog, I wanted to contribute a post to ME Awareness Week within this context. 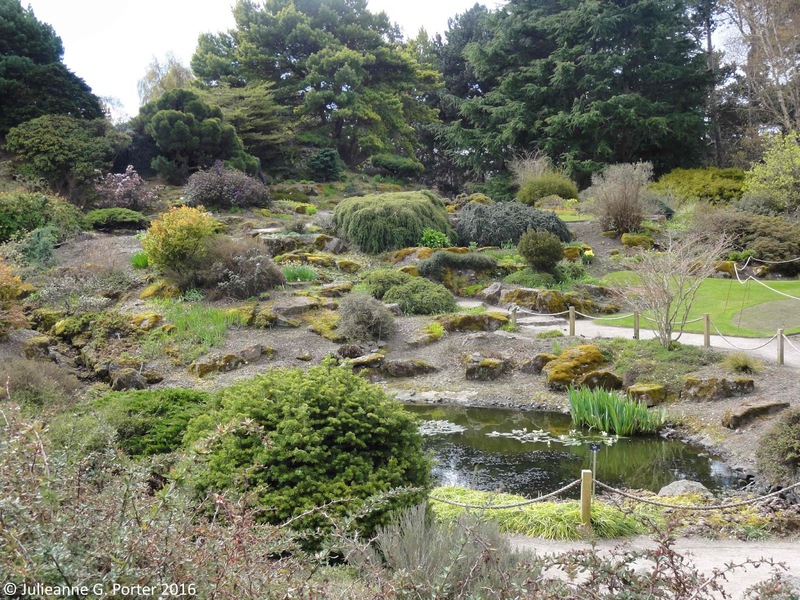 After some recent experiences visiting some large gardens in Scotland, I wanted to write about how you can enjoy visiting gardens with ME. It means giving yourself permission to be bolshy and not worry about what people think! If you have mild or moderate ME (I have moderate*), with careful planning you can still go out occasionally. Like many gardeners, I enjoy visiting other peoples gardens, whether small NGS Gardens or large botanic or estate gardens. However, when you have a chronic illness, visiting large gardens can be difficult as you don't have the energy to walk very far, particularly if it is hilly and even if there are plenty of seats to rest on in the gardens. This was what I was faced with recently, when I wanted to visit Logan Botanic Garden, Threave Garden and Estate and Royal Botanical Gardens Edinburgh. I had limited energy, only a few spoons available to allow me to get out, but not many. Enough for maybe a couple of short gentle walks as long as it was broken up with regular resting. But each of these gardens were large and there was no way I could see each of them in much depth. This is where the bolshy part comes in. One of the big problems people with a chronic illness or disability, is perceptions/stereotypes. One perception is that if you are out and about, doing a bit of shopping, spending a small amount of time gardening, that you 'must be well after all'. So in other words, you have been 'faking' your illness. But chronic illnesses fluctuate, you have many bad days and occasional good ones. And on the good days, why shouldn't you choose to take part in the world like healthy people do? The other perception is that if you use a wheelchair (or mobility scooter), you are 'wheelchair bound'. Whilst this might be true for some people, in most cases, wheelchairs and other mobility aids are there to help you get about. If a wheelchair user gets out of their chair in a supermarket to pick out some grocery items, some people will think they they aren't really disabled, that they are faking it. But the wheelchair is there to enable the user to be able to take part in the world, from picking up so groceries to being able have a job. This includes enabling you to enjoy getting outside to visit a garden. However. Yes, there is a but. Many people, including those with chronic illnesses, often don't like to take advantage of these opportunities. They probably think things like what I used to think, 'I'm not ill enough', 'really ill people need these more than I', or the 'but if I get out of the scooter/chair, people will think I'm faking it'. Trying to define 'ill enough' and 'really ill people' is like how long is a piece of string. And would you judge other people so harshly? Of course not. But it's the latter, the 'faking it' worry, that often is the strongest reason that stops us from using the on-site scooters. Do you know what? WHO CARES what others think! You know what you can or cannot do. It's not up to others to decide this for you. In fact, it's none of their goddamn business. Don't let worries about their perceptions impact on you being able to take part in the world. You know if you only have enough energy to see a small part of a large garden by walking, and if using a scooter would enable you see and enjoy much more of the garden. It's time to get bolshy and not let worries about what other people might think stop you from enjoying yourself. And this is what I did recently at these three gardens. I confess, it wasn't easy. I did worry about other people thinking I was faking it. But I made the decision to challenge these worries and to tell them to bugger off. I hired the scooters, got in and out of them, and bloody damn well enjoyed myself at all three gardens. I've even blogged about Logan and Edinburgh gardens, so you can see what I got up to. What this comes down to, is that the three gardens I wished to see appeared inaccessible to me, became accessible. Don't let worrying use up your limited spoons, use those spoons to have a bit of fun instead. Beam up the bolshiness Scotty, and go garden visiting with ME. *On the ME Associations Disability Rating Scale, 2016, I'm around 50%. **Often for free, though a donation to help with the upkeep is always welcome. You can call up and book in advance, which I did for the Edinburgh garden, or just rock up and hope one is free The latter more likely during weekdays or if you get there earlier in the day, hence booking for busy sites like Edinburgh is a good idea. 9th to 15th May is ME Awareness Week, with 12th May being ME Awareness Day. The idea is to raise awareness of the impact of ME (and other chronic illnesses) has on people's lives, in the hope that friends, colleagues and family can better understand how this illness impacts on everyday experiences. I'm joining in with the #May12BlogBomb, organised by Sally Burch, linking up with bloggers and others on social media to connect and share our experiences. If you would like to know more about ME, both the ME Association and Action for ME provide good introductory information. Great post - I'll get my mum to read - she often has to stay behind when others go on visits due to limited energy levels. I'm pretty mobile for someone with ME, but I always use mobility buggies wherever they're available, especially if a place is unfamiliar - you never know whether you're going to get halfway round and have your legs give out, or there aren't going to be benches, or there's suddenly going to be a hill you just can't climb under your own steam. And quite often there's a long walk from the car park to the garden, so you've used up all your spoons before you even get to the bits you want to see. I also sometimes get R to ring in advance and check whether there's a drop-off point for disabled people - and quite often places like NT gardens will let you park somewhere closer than the main car park if you explain that you're disabled, even if you don't have a blue badge (which I no longer do). I have been stared at occasionally when I've got out of buggy and walked a bit, but no-one has ever said anything negative - the only comments I've got have been from people saying what a great idea the buggies are and how they have a partner/parent/friend who has one or could do with one. Oh - and I often use the loo for disabled people too, because quite often in gardens the loos for everyone else aren't very accessible, or you have to walk miles to get to them. Again, I've been stared at, but I've never had any comments. PS sorry I'm a bit late with my comment - I'm struggling to keep up with everyone at the moment. I love this :) As you say, who cares what people think! It's not your job to try and educate them to your situation, don't waste the spoons on them! I'm so glad you enjoyed your garden visits.